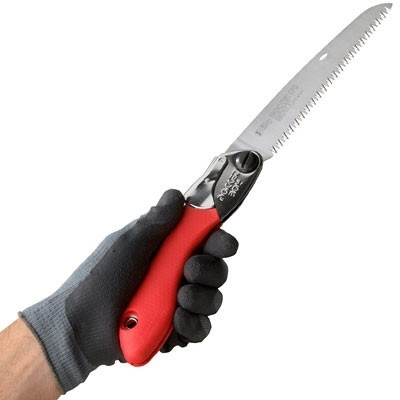 Compact lightweight folding saw with 6-3/4-inch blade that will take up very little room in your pocket or backpack. Nicknamed as "Little Giant" due to its extraordinary cutting capacity. This sleek saw features rust-resistant, hard chrome-plated, taper-ground blade with an impulse-hardened non-set tooth design for greater cutting efficiency. Utilizes proprietary Silky MIRAI-ME (Smooth Cutting) Technology - The Teeth of the Future! The precision-ground, razor sharp blade provide fast, clean and smooth cutting. The blade locks securely into one of two open positions, in line with the handle and flush cutting. The blade resists the effects of tree resin and easily wipes clean. The non-slip rubberized handle provides a sure and comfortable grip even in the most difficult operating conditions. Exceptional design, strength, balance and superior finish quality. Clear plastic flip-lock carrying case with belt clip is included. An ideal saw for your glove box or to carry on hikes. Made in Japan.